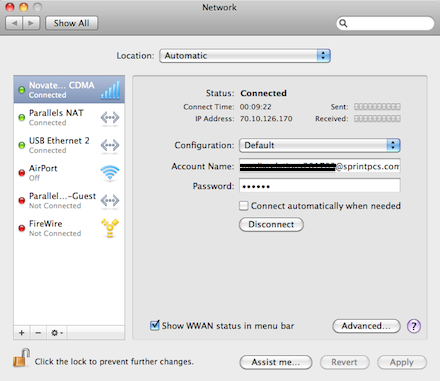 As expected, I upgraded my MacBook Pro to Snow Leopard and my Sprint Novatel u727 EVDO modem wouldn’t work. Basically the problem is you don’t need the SmartView software, but it fails to uninstall. So here is how you manually uninstall it. Disconnect the u727 and open terminal and run these three commands then reboot — always be careful with sudo and especially rm -rf, they can destroy your data if you aren’t careful. Now after you reboot, plug in the u727. At first it’ll pop up like a USB drive, eject it and eventually a Network dialog box will pop up, so hit preferences — not sure if there is a way to always prevent it from mounting. Now you should see it listed with the other network devices other system preferences. Hit “Apply” at the bottom right, and now hit connect. The best part is now you don’t need SmartView and whenever you plug the modem in, the WWAN icon will show up on the menu bar which is much better and something that never worked with SmartView installed. I’m pretty upset today because I finally decided to give up on my beloved MacBook Air. It’s been a love hate relationship almost since the very beginning, but the frustration I experienced while trying to record the podcast recently has thrown me over the edge. Those that listen to the show live on Tuesdays know that I have to put an ice pack under the Air while I record or it’ll over heat and ruin the recording. This is just so absurd but believe me I’ve researched it plenty and came to the conclusion that the Air simply isn’t designed properly and thus the CPU can’t even come close to running 80% for any extended period of time without overheating (kernel_task uses up all the cycles). So I finally broke down today and bought a 13-inch MacBook Pro. Ultimately it came down to be being less superficial than I usually am when it comes to computers and swallowing my pride. You see I just hate the idea of buying another laptop with a useless optical drive. So while I’ll almost never use the DVD drive I’m now faced with carrying around, at least I’ll have the following perks. No overheating, no loud fan running all the time, two USB ports, a Firewire 800 port to capture HDV with, an SD slot (which in effect frees up another USB port), about 30% more battery life, another 80GB of disc space, and some much appreciated performance. And for this I gave up about $100, a 20-inch Apple Cinema display, and about 1.5lbs to carry around when I travel. Seems like a good trade, but I miss my Air already; dammit Apple.